Today, rapid change is a constant challenge in the workplace, and thousands of individuals need to be involved in continuous learning. Traditional training approaches, however, do not emphasise informal and incidental learning. Furthermore, since informal learning us seldom designed, learning outside of a structured experience may lead to mistaken or dysfunctional learning. Strategies for improving informal learning are urgently needed. This book, first published in 1990, responds to this need by taking a challenging look at many assumptions about workplace learning outside of the classroom and by proposing methods to improve it. They develop a theory of informal and incidental workplace learning based on current developments in training and human resource development which they illustrate with readable and illuminating case studies which tell vivid stories of adult education and human resource development practice. 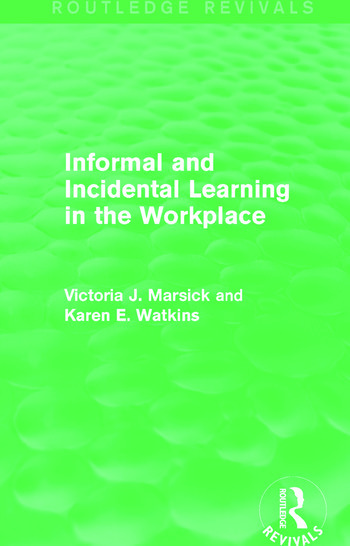 Informal and Incidental Learning in the Workplace is essential reading for researchers and practitioners of human resource development, and also for students of education and adult learning.